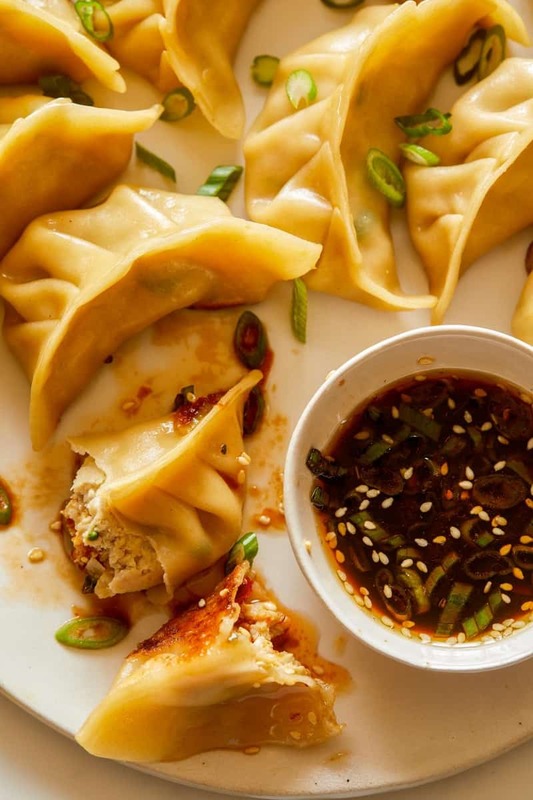 These potstickers are easier to make than they appear. You buy the wonton wrappers so that part is taken care of. All you have to make is the delicious filling. I love the chicken because it doesn’t feel as heavy as others, and the ginger makes these really fresh tasting. These are really great to make ahead and freeze, and perfect for game day. I personally love to eat these for dinner with a little side salad. Because these freeze so well you might as well make a bunch and save some for later. Happy Monday! 1. Pour sesame oil into a pan and place over medium heat. Add shallots and bok choy and saute for 3 to 4 minutes. Lightly season with salt and pepper and remove from heat to cool. 2. In a large mixing bowl, combine ground chicken, ginger, garlic, green onion and cooled bok choy mixture. Season mixture well with salt and pepper and mix together until everything I evenly combined. 5. 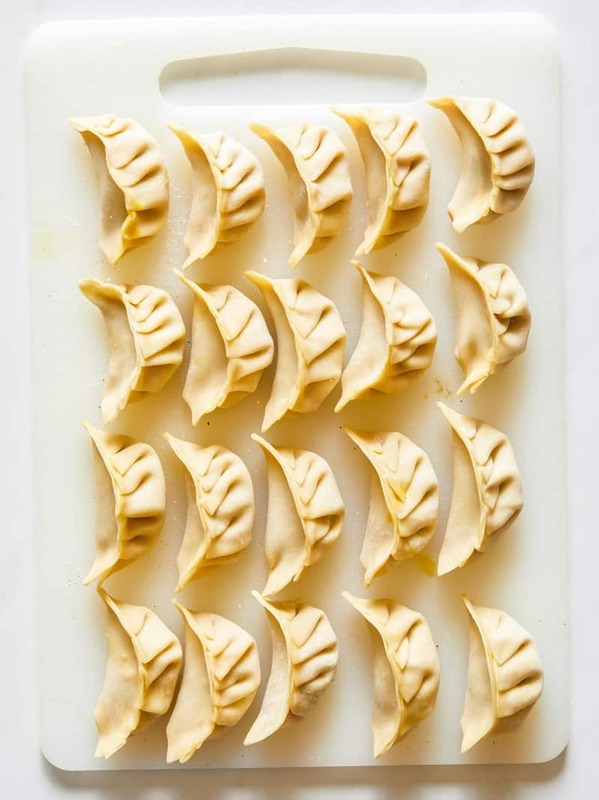 Fold dumpling in half, making sure to get rid of any air pockets before completely sealing. You should be left with a half circle. Transfer dumpling to a clean plate, resting sealed side up. 7. Pour 1 tablespoon oil into a large skillet over medium-high heat and swirl skillet to cover entire bottom with oil. 8. Add about 1/3 of the dumplings to the skillet, seam side up and about 1/2 inch apart, and sear for 2 to 3 minutes. 9. 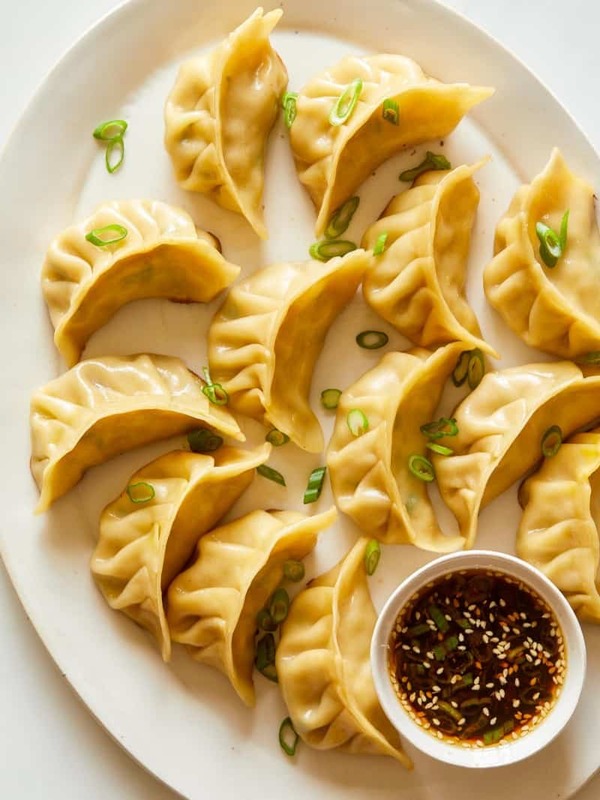 Pour 1/4 cup water into the side of the skillet and quickly cover the skillet with a lid for about 3 to 4 minutes or until steam dissipates and dumplings have cooked though completely. 10. Repeat steps 7 through 9 until all pot stickers have been cooked through. Serve with a side of soy sauce for dipping. Oops! Just read 40. Thank you! Hi, I absolutely love all of your recipes, thank you for sharing. Can you share with me your dipping sauce recipe? Thank you for your time and consideration. Nice recipe. The round wrappers are indeed called “dumpling” wrappers. Your added dipping sauce, rather than just soya sauce, is much prefered by dumpling/potsticker connaisseurs. Thanks. Has anyone tried to make these in an air fryer? Would love to hear about it, if so.